Every year Jeans confirm to be a timeless clothing item suitable for any occasion and with any type of look. It is the same in 2018, too, for jeans will represent one of the guaranteed trendies. If, on one hand, eco furs, velvet gowns and shoulder bags are the trends of the moment in woman fashion, on the other, we already know that they won’t last more than a blink of an eye. The same cannot be said for jeans, however, a timeless clothing item always appreciated on any occasion and in every season. Loyal allies in any period of the year, jeans will be worn again in 2018 in every variation. From high waist models to skinny jeans on faded black. But what are exactly the six models that will accompany us during Winter as well as Spring and Summer 2018? There will be no difference among the seasons for the proposed versions are actually evergreen and for all budgets. One of the most loved models is represented by the large jeans with belt and maxi fiber presented by Uterqüe, which is a super soft model that fits to everybody. More expansive and refined are the straight jeans with embroidered flowers and tigers designed by Alessandro Michele for Gucci. Then, there are the low cost jeans by Zara in their skinny, black, short version for an ultra slim model that every woman need in her wardrobe. Classic dark blue jeans – the so-called worker denim for a very stretching wearability and straight line – or the high waist jeans like in the ‘90s? This will be a very difficult choice to make in Spring. 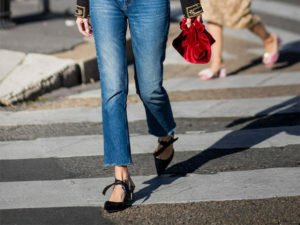 Finally, another valid alternative is represented by boyfriend jeans with a denim totally designed by Balenciaga, the new branded denim 4.0 by Demna Gvasalia.